Until the 6th of November the weather was fine, and the movement of the army executed with the greatest success. The cold weather began on the 7th; from that moment, every night we lost several hundred horses, which died at the bivouac. Arriving at Smolensk, we had already lost many cavalry and artillery horses. The Russian army from Volhynia was opposed to our right: our right left the Minsk line of operations, and took for the pivot of its operations the Warsaw line. On the 9th, the Emperor was informed at Smolensk of this change in the line of operations, and presumed what the enemy would do. However hard it appeared to him to put himself in movement during so cruel a season, the new state of things demanded it. He expected to arrive at Minsk, or at least upon the Beresina, before the enemy; on the 13th, he left Smolensk; on the 16th he slept at Krasnöe. The cold, which began on the 7th, suddenly increased, and on the 14th, 15th and 16th the thermometer was sixteen and eighteen degrees below the freezing point. The roads were covered with ice; the cavalry, artillery and baggage horses perished every night, not only by hundreds, but by thousands, particularly the German and French horses. In a few days, more than 30,000 horses perished; our cavalry were on foot; our artillery and our baggage were without conveyance. It was necessary to abandon and destroy a good part of our cannon, ammunition and provisions. This army, so fine on the 6th, was very different on the 14th, almost without cavalry, without artillery and without transports. Without cavalry, we could not reconnoiter a quarter of a league’s distance; without artillery, we could not risk a battle and firmly await it: it was requisite to march in order not to be constrained to a battle, which the want of ammunition prevented us from desiring; it was requisite to occupy a certain space, not to be turned, and that too without cavalry, which could lead and connect the columns. This difficulty, along with a cold that suddenly came on, rendered our situation miserable. Those men whom nature had not sufficiently steeled to be above all the changes of fate and fortune, lost their gaiety, their good humor, and dreamed but of misfortunes and catastrophes; those whom she has created superior to everything, preserved their gaiety, and their ordinary manners, and saw fresh glory in the different difficulties to be surmounted. The enemy, who saw upon the roads traces of that frightful calamity which had overtaken the French army, endeavored to take advantage of it. It surrounded all the columns with his Cossacks, who carried off, like the Arabs in the desert, the trains and carriages that separated. This contemptible cavalry, which only makes noise and is not capable of penetrating through a company of voltigeurs, rendered itself formidable by favor of circumstances. Nevertheless, the enemy had to repent of all the serious attempts that it wished to undertake: they were overthrown by the Viceroy, before whom they were placed, and lost many men. The Duke of Elchingen, who with 3,000 men made up the rearguard, had blown up the ramparts of Smolensk: he was surrounded, and found himself in a critical position, but he extricated himself from it with that intrepidity by which he is distinguished. After having kept the enemy at a distance from him during all of the 18th, and constantly repulsing it at night, he made a movement on the right, crossed the Borysthenes, and deceived all the calculations of the enemy. On the 19th, the army crossed the Borysthenes at Orsha; and the Russian army being fatigued, and having lost a great number of men, ceased from its attempts. The army of Volhynia had moved on the 16th to Minsk, and marched on Borisov. General Dombrowski defended the bridgehead of Borisov with 3,000 men. On the 23rd, he was forced, and obliged to evacuate this position. The enemy then crossed the Beresina, marching on Bobr; the Lambert division formed the advanced guard. The 2nd corps, which was at Tschereia commanded by the Duke of Reggio, had received orders to march on Borisov to secure for the army the crossing of the Beresina. On the 24th, the Duke of Reggio met the Lambert division four leagues from Borisov, attacked and defeated it, took 2,000 prisoners, six pieces of cannon, 500 baggage wagons of the army of Volhynia, and threw the enemy on the right bank of the Beresina. General Berckheim, with the 4th cuirassiers, distinguished himself by a fine charge. The enemy could only secure its safety by burning the bridge, which is more than 300 toises in length. Nevertheless, the enemy occupied all the passages of the Beresina: this river is forty toises wide, and had much floating ice on it, but its banks are covered with marshes 300 toises long, which present great obstacles in clearing it. The enemy’s general had placed his four divisions at different debouches, where he presumed the French army would cross. On the 26th, at daybreak, the Emperor, after having deceived the enemy by different movements made during the day of the 25th, marched on the village of Studianka, and caused, in spite of the enemy’s division, and in its presence, two bridges to be thrown over the river. The Duke of Reggio crossed, attacked the enemy, and led him, fighting two hours. The enemy retired on the bridgehead of Borisov. General Legrand, an officer of the first rate merit, was badly, but not dangerously, wounded. During all of the 26th and 27th, the army crossed. The Duke of Belluno, commanding the 9th corps, had received orders to follow the movement of the Duke of Reggio, to form the rearguard and keep the Russian army from the Dwina that followed him in check. Partouneaux’s division formed the rearguard of this corps. On the 27th, at noon, the Duke of Belluno arrived with two divisions at the bridge of Studianka. Partouneaux’s division set out at night from Borisov. A brigade of this division, which formed the rearguard and which was charged with burning the bridge, marched at seven in the evening, and arrived between ten and eleven o’clock; it sought its first brigade and its General who had departed two hours before, and which it had not met with in its route. Its searches were in vain. Some uneasiness was then conceived. All we have since been able to learn is that the first brigade set out at five o’clock, missed its way at six, went to the right in place of proceeding to the left, and marched two or three leagues in this direction; that, during the night, and benumbed with cold, it rallied at seeing the enemies’ fires, which it mistook for those of the French army. Thus surrounded, it was taken. This cruel mistake must have caused us a loss of 2,000 infantry, 300 cavalry, and three pieces of artillery. Reports state that the General of Division was not with his column, and had marched alone. All the army having crossed on the morning of the 28th, the Duke of Belluno guarded the bridgehead on the left bank; the Duke of Reggio, and behind him all the army, was on the right bank. Borisov having been evacuated, the armies of the Dwina and Volhynia communicated; they planned an attack. On the 28th, at daybreak, the Duke of Reggio caused the Emperor to be informed that he was attacked. Half an hour afterwards, the Duke of Belluno also was attacked on the left bank. The army took to arms. The Duke of Elchingen immediately followed the Duke of Reggio, and the Duke of Treviso behind the Duke of Elchingen. The battle heated up. The enemy wishing to turn our right, General Doumerc, commanding the fifth division of cuirassiers that made part of the second corps that remained on the Dwina, ordered a charge of cavalry by the fourth and fifth regiments of cuirassiers, at the moment when the legion of the Vistula was engaged in the woods, to pierce the center of the enemy. The enemy was defeated and put to route. These brave cuirassiers successively pushed in 4 squares of infantry, and put to rout the enemy’s cavalry, which came to the assistance of his infantry. Six thousand prisoners, two standards, and six pieces of cannon fell into our hands. On his side, the Duke of Belluno vigorously charged the enemy, defeated him, took from five to six hundred prisoners, and kept him from advancing within reach of the cannon of the bridge. General Fournier made a fine charge of cavalry. In the battle of the Beresina, the army of Volhynia suffered much. The Duke of Reggio was wounded, but his wound is not dangerous. He received a ball in his side. The next day (the 29th) we remained on the battlefield. We had to make our choice between two routes: that to Minsk, and that to Vilna. The road to Minsk led through the middle of a forest, and of uncultivated marshes, where it would be impossible for the army to subsist. On the other hand the road to Vilna led through a very fine country. The army being without cavalry, deficient in ammunition, and horribly fatigued by fifty days’ march, carrying in its train all the sick and wounded of so many battles, stood greatly in need of getting to its magazines. On the 30th, the headquarters were at Plechnitsie [Plaszczenitzy]; on the 1st of December at Slaiki; on the 3rd at Molodetchna, where the army received the first convoys from Vilna. All the wounded officers and soldiers, and whatever else that could be of encumbrance, with the baggage, etc. were sent off to Vilna. 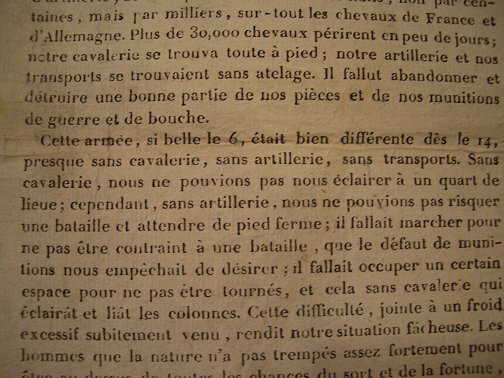 To say that the army needs to re-establish its discipline, to refresh itself, to remount its cavalry, complete its artillery and its materiel; this is the result of the expose that has just been made. Its repose is of the first necessity. The materiel and the horses are coming in; General Bourcier has already more than 20,000 remount horses in different depots. The artillery has already repaired its losses. The generals, officers and soldiers have suffered greatly from want. Numbers have lost their baggage by the loss of their horses, and several by the effect of the Cossacks’ ambushes. The Cossacks have taken numbers of isolated persons, geographical engineers who were taking positions, and wounded officers who were marching without precaution, preferring running rather than marching slowly and going with the convoys. The reports of the general officers commanding the different corps will make known what officers and soldiers have chiefly distinguished themselves, and the details of all these memorable events. In all these movements the Emperor has continually marched in the middle of his Guard, the cavalry commanded by the Duke of Istria and the infantry commanded by the Duke of Danzig. His Majesty has been well pleased with the fine spirit shown by his Guard. They have always been ready to show themselves wherever their presence was needful, but circumstances have always been such that their appearance alone was sufficient, and that they never were in a situation that required them to charge. The Prince of Neuchâtel, the Grand Marshal, the Grand Equerry, and all the aides-de-camp and military officers of the house of the Emperor have always accompanied His Majesty. Our cavalry was dismounted to such a degree that it was necessary to collect the officers who had still a horse remaining, in order to form four companies of 150 men each. The generals there performed the functions of captains, and the colonels of subalterns. This sacred squadron, commanded by General Grouchy, and under the orders of the King of Naples, did not lose sight of the Emperor in all these movements. The health of His Majesty was never better. J. David Markham, Imperial Glory: The Bulletins of Napoleon’s Grande Armée 1805-1814 (London, 2003), 310-313. 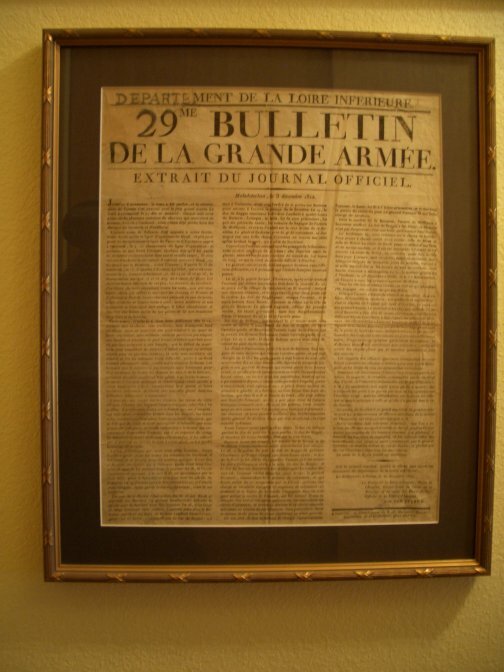 This book was the first complete English translation of Napoleon’s Bulletins ever published. - The Bulletin pictured here is from the David Markham Collection.